or combinations of such scores in five-factor profiles will provide adequate screening possibilities for PDs. sonnel with a profound knowledge of psychopathology. screening capacity for PD in terms of the DSM-IV and ICD-10. require a great deal of specific clinical training. have poor specificity (Verheul &Van Den Brink, 1999). *Acknowledgements and Disclosure of Interest: None. using assessment instruments for basic personality dimensions. prehensive framework for structuring individual differences. depth, and complexity of mental and experiential life). theoretical foundations as the NEO-PI-R but has only 60 items. might be a screener for PD. screener in an outpatient psychiatric population. 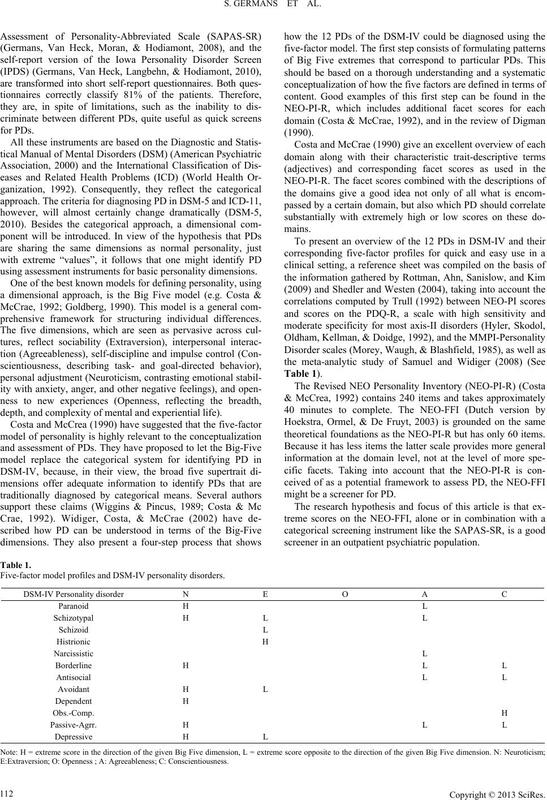 Five-factor model profiles and DSM-IV personality disorders. E:Extraversion; O: Openness ; A: Agreeableness; C: Conscientiousness. by the referring physician in the case of five patients (2.5%). 5-point Likert scales. Consequently, scores range from 12 to 60.
highest (90% - 100%) decile. was validated in a sample of clinical and polyclinical patients. The alpha coefficient for the total score of the SAPAS was .68.
sults prior to the SCID-II interview session. extremity of rating) to 4 (extremity of rating on four traits). (χ2(1, N = 195) = .072, p = .79). that showed no extreme score on any of the five-factor domains. = .172, p = .68; χ2(1, N = 195) = .001, p = .97). non-significant and very weak, r = −.05, p = .47.
classified cases were calculated. Table 4 gives an overview. the schizoid PD profile, c2(1, N = 195) = 12.06, p = .001. 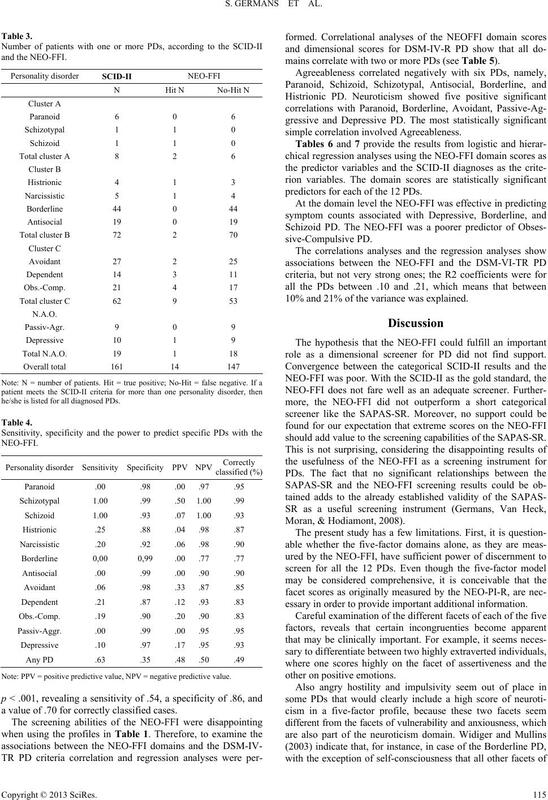 Dimensional scores for the five NEO-FFI personality factors. he/she is listed for all diagnosed PDs. Note: PPV = positive predictive value, NPV = negative predictive value. a value of .70 for correctly classified cases. mains correlate with two or more PDs (see Table 5). predictors for each of the 12 PDs. 10% and 21% of the variance was explained. role as a dimensional screener for PD did not find support. should add value to the screening capabilities of the SAPAS-SR.
essary in order to provide important additional information. 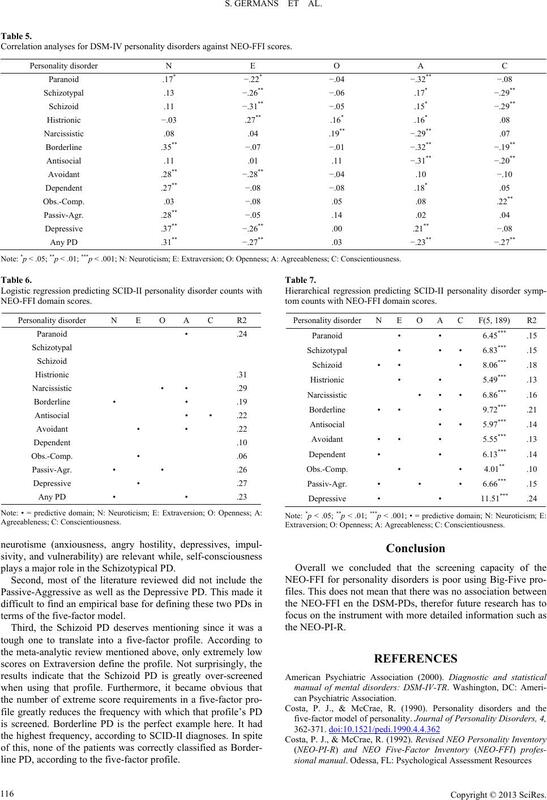 Correlation analyses for DSM-IV personality disorders against NEO-FFI scores. Note: *p < .05; **p < .01; ***p < .001; N: Neuroticism; E: Extraversion; O: Openness; A: Agreeableness; C: Conscientiousness. Agreeableness; C: Conscientiousn ess . plays a major role in the Schizotypical PD. terms of the five-factor model. line PD, according to the five-factor profile. tom counts with NEO-FFI domain scores. Extraversion; O: Openness; A: Agreeableness; C: Conscientiousness. model. Annual Review of Psychology, 41, 417-440. DSM-5 Work Group (1990). Re: Personality and personality disorders. URL (last checked 12 December 2012). II): Part I: Description. 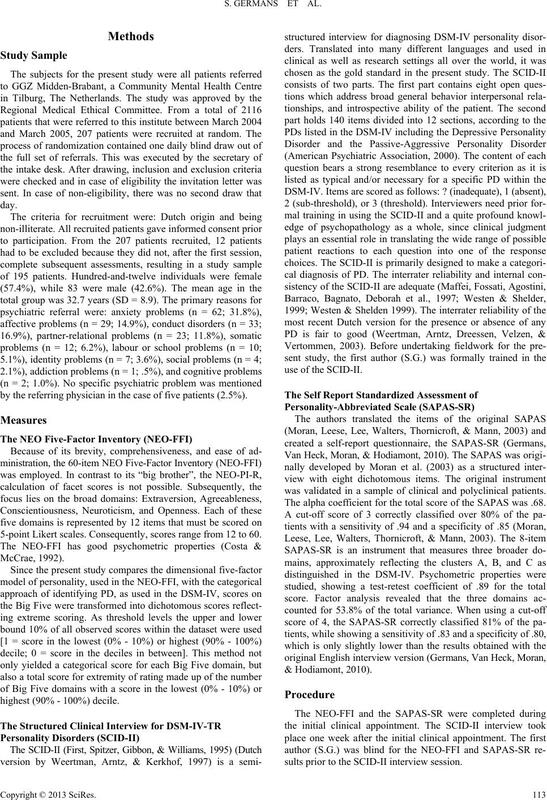 Journal of Personality Disorders, 9, 92-104. Germans, S., Van Heck, G. L., Langbehn, D. R., & Hodiamont P. P. G.
Germans, S., Van Heck, G. L., Moran. P., & Hodiamont, P. P. G.
sonality disorders. Personality and Mental Health, 2, 70-76.
naire). Lisse: Swets & Zeitlinger B.V.
Hyler, S. E., Skodol, A. E., Kellman, H., Oldham, J. M., & Rosnick, L.
Hyler, S., Skodol, A., Oldham, J. M., Kellman, H. D., & Doidge, N.
Bellodi, L., Cadoret, R., Grove, W., Pilkonis, P., & Links, P. (1999). (SCID II) version 2.0. Journal of Personality Disorders, 11, 85-92. Moran, P., Leese, M., Lee, T., Walter, P., Thornicroft, G., & Mann, A.
disorder. British Journal of Psychiatry, 183, 228-232. Moran, P., Walsh, E., Tyrer, P., Burns, T., Creed, F., & Fahy, T. (2003). for DSM-III personality disorders: Their derivation and correlates. 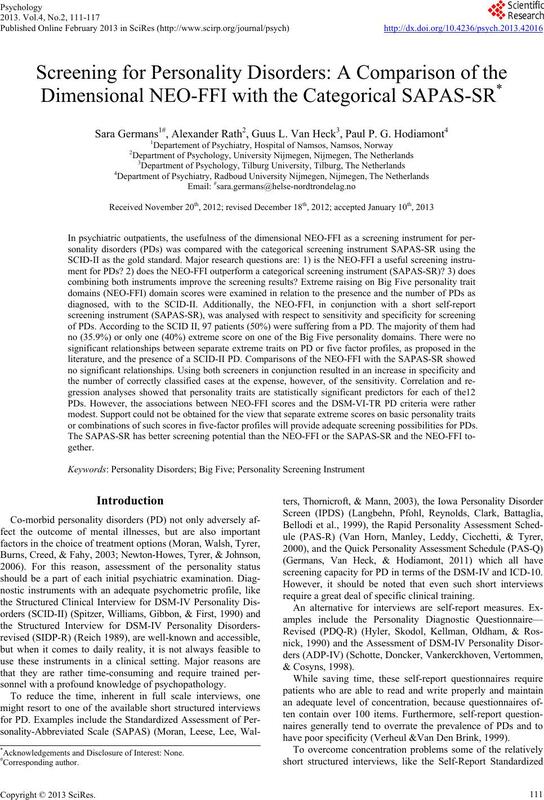 Journal of Personality Assessment, 49, 245-251.
ies. British Journal of Psychiatry, 188, 13-20. ADP-IV. 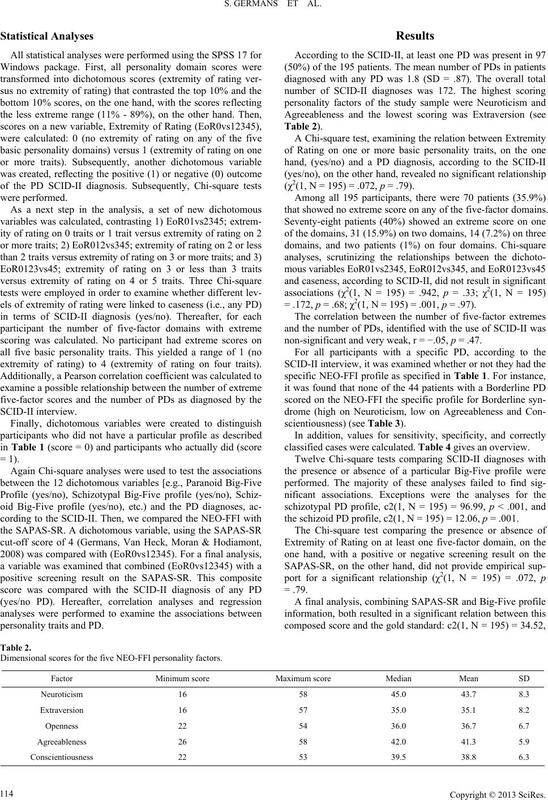 Psychological Medicine, 28, 1179-1188.
clinical interview for the DSM-III-R personality disorders (SCID-II). Van Horn, E., Manley, C., Leddy, D., Cicchetti, D., & Tyrer, P. (2000). personality status. European Psychiatry, 15, 29-33.
disorders (SCID-II). Journal of Personality Disorders, 17, 562-567.
ders). Lisse: Swets Test Publisher. Development of a clinically and empirically valid assessment method. 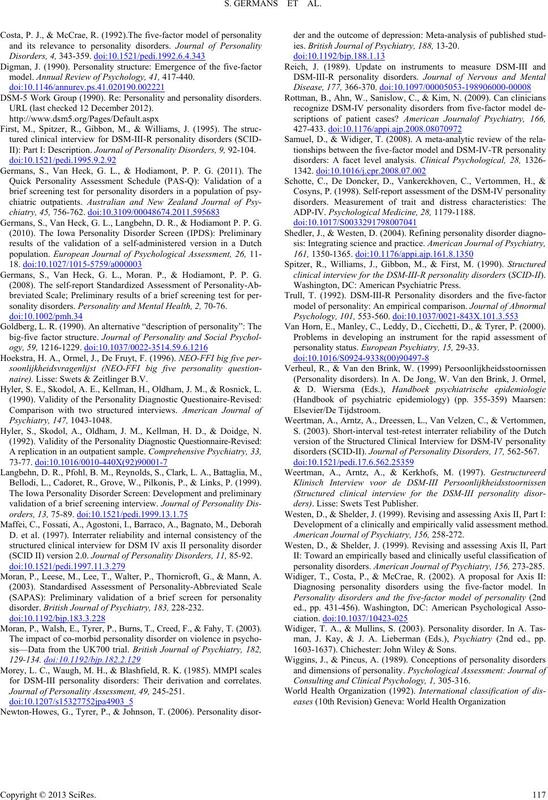 American Journal of Psychiatry, 156, 258-272.
personality disorders. American Journal of Psychiatry, 156, 273-285.
man, J. Kay, & J. A. Lieberman (Eds. ), Psychiatry (2nd ed., pp. 1603-1637). Chichester: John Wiley & Sons. Consulting and Clinical Psychology, 1, 305-316.